Tip-a-Cop at Red Robin this Saturday! On October 18th the Law Enforcement Torch Run for Special Olympics Nebraska will be hosting their annual Tip-a-Cop event at area Red Robin restaurants. The event runs from 11am-3pm and from 4-8pm. Local Law enforcement officers will volunteer their time as servers alongside Red Robin’s wait staff to collect tips from guests to raise funds for Special Olympics Nebraska. 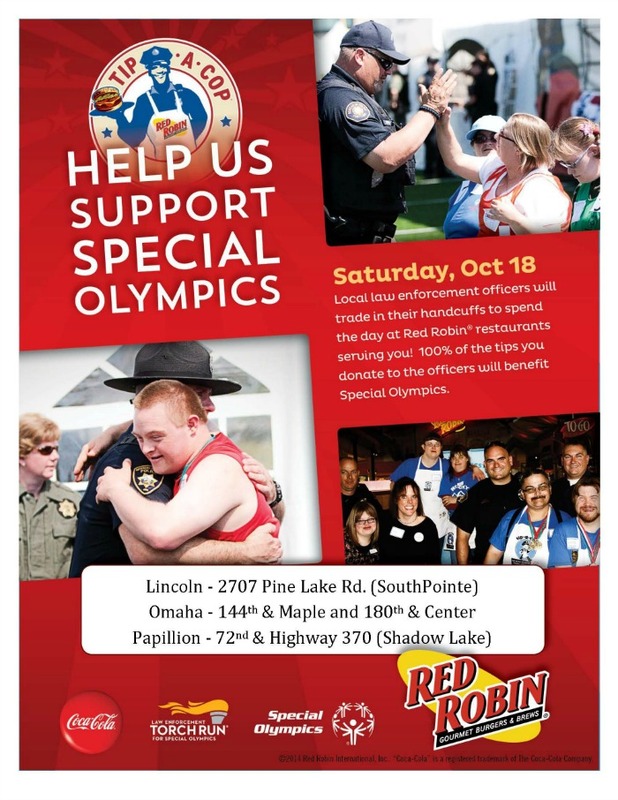 There will also be many Special Olympics Nebraska athletes supporting the event by helping the law enforcement volunteers greet the guests If you and your friends or family are heading out for lunch or dinner on Saturday the 18th please choose Red Robin and show your support for Special Olympics Nebraska.